Sunjang Baduk was a variant commonly played in Korea about the XVI Century. 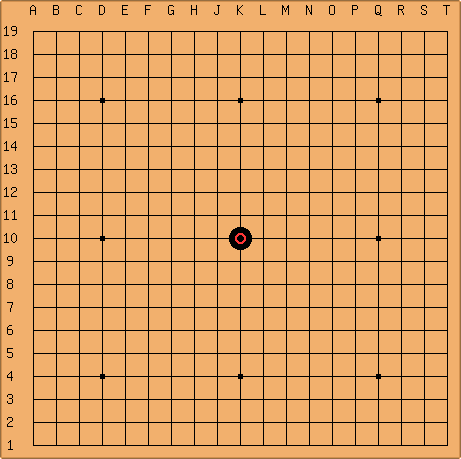 Its most distinctive feature is the setting up of an initial position that leads directly to a middle-game battle. On June 21st, 2011, a thread was posted on the OGS forums, expressing the intention to organize a tournament under the Sunjang rules. It soon received positive response from some interested players and the organization took off. The tournament is played using a league format as laid down by the organizers. 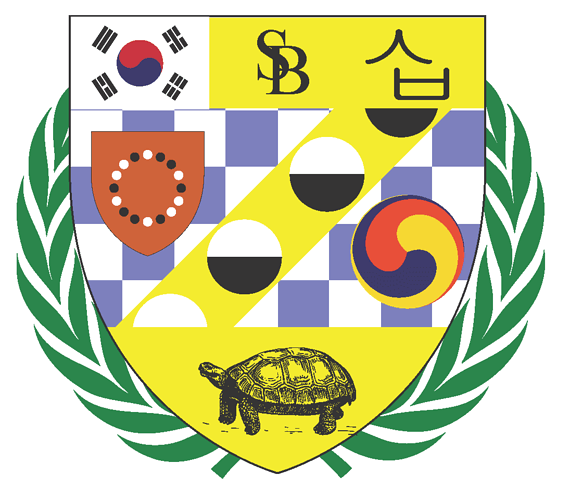 Since 2013, and following the merge between OGS and Nova.gs, the tournament has been implemented using the built-in server tools, and hosted by the Sunjang Baduk group. There are a series of guidelines and settings used by the Tournament Directors for the purpose of running this competition, which you're encouraged to read if you feel so inclined. In order to have everything running smoothly, there are a few guidelines the participants are expected to follow. Needless to say, but OGS terms of service are to be respected. 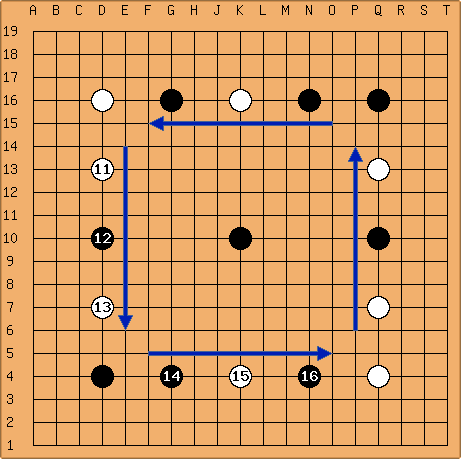 Players must start with the accorded initial moves. Accidental mistakes should be conscientiously corrected using the undo feature, refusing to do so will be considered an immediate forfeiture of the game by the offending player without exception. Disqualification may occur in case of repeated offenses. Timing-out is seriously discouraged. However, pausing the game will be left to the opponent's discretion. In general, please just be nice, say Hello and good game when you begin, and thank your opponent when you finish. In case of a dispute, the tournament director should be called out to give a ruling; but before we get to that, please remember that a great deal of quarrels are rooted on misunderstandings rather than ill intentions from any of the parties, so always try to work things out. The only requisite is the commitment to play by the rules of Sunjang Baduk (regarding the initial setup of the stones). It is also strongly recommended learning how to use the Conditional Moves feature. On the starting date you'll be sent an invitation for a minitournament under the label Sunjang Baduk Tournament Season ... (Group ...). Please join it. Wherever you play Black, you must make your first move at K10 (Tengen, the center of the board). 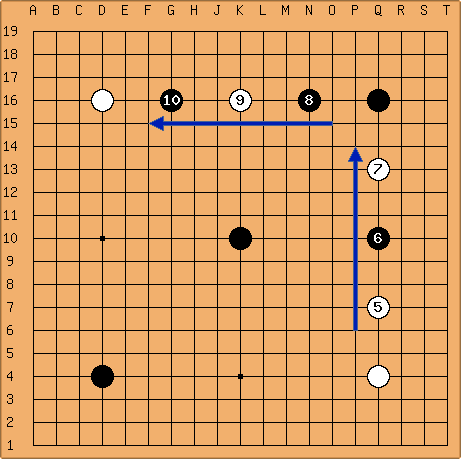 This is an unusual opening, and will serve as a cue to the opponent that the game must follow a special setup. You may also write "SUNJANG BADUK" in the game chat to avoid any mistakes. If you are playing White, your responses should go according to the diagrams above. After that, the game continues just as normal. That tournament is created close to the date of the event. 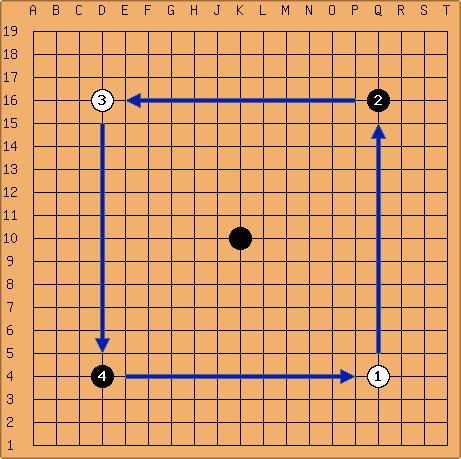 Normally, in Sunjang Baduk, Tengen is mandatory as Black's first "free move". Leira: this page is not intended as advertisement, but rather to help with the organization of this tournament as an annual event. If you can help polishing up these pages it will be much appreciated.